What is a Mechanical Ventilator, and why it is important in my HVAC system? What is the difference between Ventilation types, and how do I know which one to use in my area? ERVs are recommended in regions where high outdoor humidity is cause for operating air conditioning/ dehumidification for an extended period of the year, and much more frequently than a heating system. The ideal geographic area of use defined by AHR standards is the Southeast U.S. – Florida, Georgia, Alabama, Mississippi, and Carolinas only. ERVs are NOT recommended in any region of Canada, or in the United States where temperatures fall below 25F (-4C) for more than five days, where freezing of the internal core can occur. The Lifebreath ERV core uses a highly efficient counterflow core to reduce humidity in the incoming air stream by transferring water molecules to the exhaust air stream. And because it utilizes a non-cellulose membrane that allows water to pass through but not air, it will not deteriorate with constant exposure to moisture. It is the only water-washable ERV core available. Lifebreath Ventilation products (HRV/ERV) move stale, contaminated, air from inside the house to outdoors. At the same time they draw fresh oxygen-laden air from outside and distribute it throughout the house. Stale, polluted air is constantly being replaced by an equal quantity of fresh clean air. 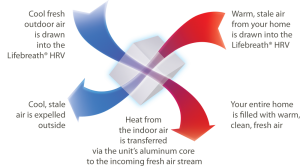 As the two air streams pass through the unit they do not mix. They pass on either side of our exclusive and patented aluminum heat-exchange (HRV) or enthalpic (ERV) cores which transfers heating/cooling energy from the outgoing air to the incoming air. The efficiency of the Lifebreath HRV and ERV is so great that virtually none of the warm/cool air collected from your home is lost to the outside. In summer, HRV and ERV’s work in reverse – removing heat from the incoming air and transferring it to the outgoing air, to keep your home cool and fresh. Lifebreath’s unique dual-stream airflow design, keeps outgoing stale air separate from incoming fresh air and completely rejuvenates the air throughout the entire home – up to eight times a day. Lifebreath’s balanced ventilation technology replaces indoor stale air with an identical amount of fresh air. This balanced ventilation is critical to prevent moisture build-up in your home during the heating season which can lead to expensive rot damage and hazardous mold. Because of the unique ability of a Lifebreath HRV and ERV to transfer the temperature of indoor stale air to the incoming fresh air, you’ll realize lower heating and cooling costs year round while enjoying all the benefits superior indoor air quality delivers. In fact, the efficiency of the Lifebreath HRV is so great that virtually none of the warmth collected from your home during winter months is lost to the outside. During summer months, the HRV works in reverse by removing heat from the incoming air and transferring it to the outgoing air, keeping your home cool and fresh. What’s makes Lifebreath the most advanced Ventilation product available? Lifebreath ventilation products efficiently transfers heating/cooling energy from outgoing stale air, to incoming fresh air. Lifebreath lets you enjoy an energy efficient home without breathing harmful indoor fumes from paint, plastics, carpets, adhesives, and household products without lingering pet odors and moisture that causes mold. Only Lifebreath has a patented aluminum core, proudly manufactured by Airia. This makes the Lifebreath core so reliable, we offer a lifetime warranty. Airia Brands offers numerous Lifebreath residential ventilation units across two product series – MAX and RNC, to meet a wide variety of customer needs. Commercial products are also available.